The Parker Library, named after Archbishop Matthew Parker (1504-1575), former master of the College, is a treasure house of medieval and Renaissance manuscripts and early printed books. 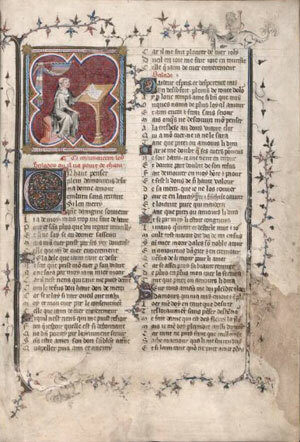 The magnificent collection was given to the College by Parker and includes the Anglo-Saxon Chronicle, principal source book for early English history, and the best manuscript of Chaucer’s Troilus. No less important to the collection are also the Middle English, French and Latin texts on subjects ranging from alchemy and astrology to music and medicine. The collection comprises over 600 manuscripts, around 480 of which were given by Parker, who also donated around 1000 printed volumes. 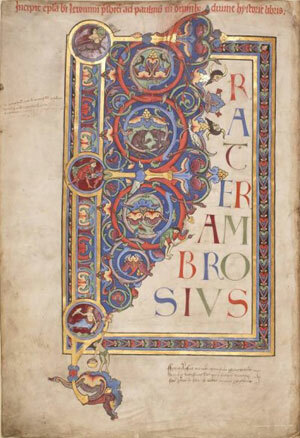 The collection includes a sixth-century Gospel book from Canterbury, which is used for the enthronement of each new Archbishop of Canterbury, the oldest illustrated Latin Gospel book now in existence. 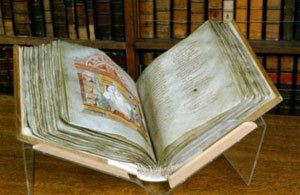 MS 144, the Corpus Glossary. 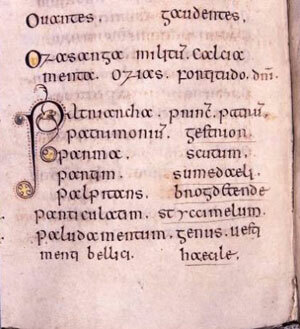 There are around 40 Old English manuscripts, including the oldest version of the Anglo-Saxon chronicle (MS 173), the Corpus Glossary, an alphabetical wordlist in Latin, with Old English equivalents (MS 144), and a lavishly illustrated copy of the Psychomachia of Prudentius (MS 23). Two of only half a dozen extant giant Romanesque Bibles form part of the Library’s collection: the Bury Bible from the Abbey of Bury St Edmunds (MS 2), and the Dover Bible, from Dover Priory, a cell of Canterbury. Above the frontispiece to the Bury Bible, MS 2i. The Library also holds an important collection of sixteenth century documents relating to the European reformers, including letters from Bucer, Melanchthon, and Erasmus, together with many of Parker’s working archival records, and personal papers. 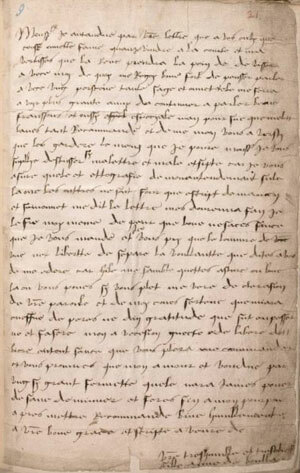 Letter from Anne Boleyn to her father. 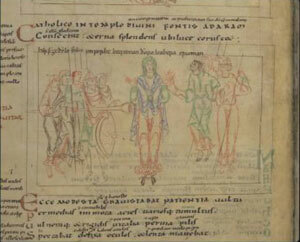 The Parker Library also holds two manuscripts from the James E. and Elizabeth J. Ferrell Collection on long-term loan, including the Codex Voguë Machaut manuscript.